Were you looking for Onyx, the material or Sarcophagus, the Dyson sphere located at the former site of Onyx? "XF-063 is a rare jewel of a find." Onyx, officially known to the UNSC as "XF-063" or Zeta Doradus IV, was a planet-sized Forerunner megastructure located in the Zeta Doradus system, and formerly the external component of the shield installation designated Shield World 006. While it had a human-habitable surface and a seemingly terrestrial crust Onyx was internally composed of trillions of Onyx Sentinels. The artificial planet's ultimate purpose was to guard the entrance to the shield world proper, a Dyson sphere held in a miniature slipspace bubble. During the Human-Covenant War, Onyx served as the headquarters of the SPARTAN-III program and was the location of the massive, three-sided Onyx Conflict in late 2552. At the conclusion of the battle, Onyx itself disintegrated, only leaving the Dyson sphere in its core intact. After the disintegration of the artificial planet, the name "Onyx" has often been applied to the Dyson shell that remains in its stead, and can be regarded as the overall name for the shield installation, comprising both the planetary shell and the Dyson sphere. Onyx, named by the UNSC Engineering Corps due to the unusually large onyx quarries found in the planet's crust, had an oxygen-nitrogen gas atmosphere, of suitable pressure for human life with a temperate weather cycle. It also had an unusually large number of indigenous species of flora and fauna, some of which were edible by humans and posed no threatening danger. The transplanting of Earth species was immediately possible. 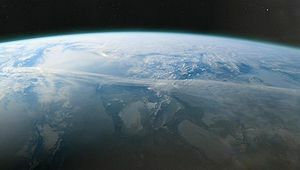 Some notable anomalies were that it had no detectable tectonic activity, an unusually strong planetary magnetic field, and slightly higher than normal background radiation. All of this was explained when it was revealed that the planet's crust was composed of large numbers of dormant Sentinels. Onyx's foundational structure was composed of trillions of Onyx Sentinels, arranged into a crystalline latticework in which the Sentinels' central spheres served as spherical joints, connected by rods which, in the Sentinel's normal arrangement, surrounded the central sphere. The planet's Earth-like landmass was laid over this structure, which also contained a vast network of subterranean tunnels and installations, at least one massive Forerunner city, a map room, and an immense Sentinel production facility under the northern polar region. In the core of Onyx, there was a large room, referred to as the core room antechamber. It contained a slipspace rift that would be open for a short time after the Halo Array was put on standby mode, allowing evacuation to the micro Dyson sphere within, acting as an escape from the Array's destructive firing. The Dyson sphere habitat, approximately 300 million kilometers in diameter, was located wholly within a maintained slipspace bubble, which was only 23 centimeters in diameter in normal space. The megastructure has a habitable, terraformed surface and in the center, a G2-type star to provide terrestrial lighting. A UNSC complex on the surface of Onyx. Onyx was discovered by the UNSC Engineering Corps sometime around May, 2491. In ENGCORP Field Report A76344, Captain D. F. Lambert stated "XF-063 is a rare jewel of a find" and recommended colonization. The Assembly quickly moved to keep colonization from occurring, as they had discovered the presence of Forerunner artifacts independently of the UNSC and feared that humanity would not be ready to learn about the existence of alien life. On February 19, 2492, in ENGCORP Field Report A79052 Lieutenant W. K. Davidson stated that Geological Expedition Four found an entire phylum of possible alien taxonomy and recommended a follow-up survey with specialists in paleobiology, xenobiology, and biochemistry. In 2511, when archaeological expeditions uncovered massive subterranean Forerunner constructions in what would after be called Zone 67, ONI immediately took control of the world, going so far as to remove Onyx from UNSC navigational databases and suspending any prospective colonization and terraforming attempts. However, further attempts to determine the purpose of the structures, or even to extract any usable technology, yielded no results. In 2525, with the coming of the Human-Covenant War, the operation was scaled down and only a minimal ONI garrison and a single AI remained. Three consecutive AIs served in this post, replacing one another once the former AI's lifespan ended; Eternal Spring, Deep Winter and Endless Summer. Due to the site's importance, a secret Slipspace COM launcher was later constructed within Zone 67. The planet's location remained secret. Regular scans continued to yield little of value. Vice Admiral Margaret Parangosky authorized the construction of the Spartan-III training base on Onyx in 2531. This base, designated Camp Currahee, was constructed perilously close to Zone 67, which had been declared strictly off limits. However, during a routine exercise north of Currahee, Spartan Team X-ray trespassed into Zone 67, entered a Forerunner structure, and disappeared without trace. An ONI investigation into the matter was inconclusive, although the Spartans were rumored to have encountered a "glowing eye" which detonated upon discovery. In 2552, Onyx's Sentinels were roused to action by the standby signal from Installation 05, instigating the Battle of Onyx and revealing Onyx's true nature. The AI Endless Summer took command of all military personnel on Onyx to immediately defend Zone 67 per General Order 98.93.120, after Onyx's Sentinels first started to attack the Spartan-IIIs. Endless Summer sent Kurt Ambrose a flash transmission of several classified files pertaining to Onyx, but was interrupted by an explosion. Soon after, the surviving UNSC forces on Onyx regrouped and declared Bloody Arrow. Kurt, CPO Mendez and the Spartan-IIIs were soon joined by Dr. Catherine Halsey and later, Blue Team, and they eventually made their way into an excavated Forerunner city in Zone 67. Meanwhile, both the Covenant and the UNSC sent battle groups to retrieve Onyx's Forerunner technologies. The UNSC battle group was destroyed in the ensuing battle. The humans, led by Kurt, fell back into the interior of Onyx and discovered its map room, where they were redirected by Endless Summer to destroy Onyx's Sentinel factory. Eventually, the survivors made a last stand against the Covenant in the core room antechamber, before retreating into the safety of the shield world. After the gateway into the shield world had closed, Kurt detonated two nuclear warheads, ensuring the Covenant did not follow his comrades. Immediately afterward, the Sentinels that had made up Onyx's foundational structure obliterated the terrestrial surface and decimated the Covenant fleet. Months later, in January 2553, a series of concentric rings of debris radiated from where Onyx had once been. The slipspace bubble housing the shield world, however, had survived intact and the Dyson sphere was eventually transitioned into normal space. ONI soon converted the shield world into a research facility, named "Trevelyan" in reference to Kurt-051's original surname. By 2554, the shield world was under joint control by the UNSC and the Swords of Sanghelios, with the two factions conducting the Onyx United Research Project there. In Halo: The Fall of Reach, its mentioned that the UNSC Pillar of Autumn took part in an ongoing conflict with the Covenant near the Zeta Doradus system which is where Onyx was located. The conflict was not further expanded upon nor has it been mentioned again, but it didn't involve Onyx which remained completely free of Covenant influence until after the portal to the shield world became active. According to Fred-104, Onyx is located weeks away from Earth in even humanity's fastest Slipspace-capable ships. In contrast, Covenant ships can cross that distance in a matter of hours. Physically, Onyx is the first Forerunner shield world located by the UNSC though only the outer planetary shell was known about until 2552. In 2531, the Etran Harborage outer planet and its inner Dyson sphere were discovered and destroyed by the UNSC Spirit of Fire. However, as the Spirit of Fire became trapped in deep space, the UNSC were left unaware of this discovery. A full view of Onyx and its moon. A star chart depicting Onyx. ↑ Halo: Fractures, "Lessons Learned"